t*rexes and tiaras: Everybody's waiting for the next surprise.. I know it seems a little early for Halloween, but I felt like wearing this dress anyway, so there we are. I snapped it up from Lindy Bop a few weeks ago in my order, but it seems to have gone out of stock by now. 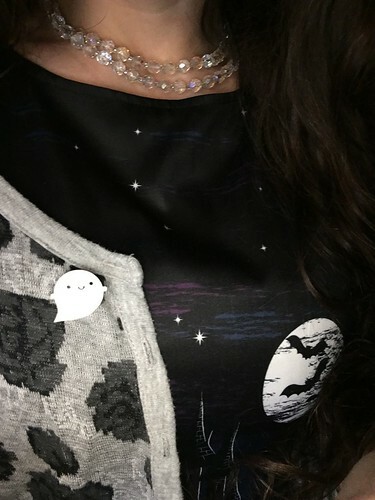 I can't resist wearing this little glow in the dark ghost brooch pretty much constantly at the moment - Marceline's website is a new find for me, but it's filled with cute jewellery and stationery and is definitely worth a look. In other jewellery news, I picked up this necklace at my favourite local vintage store the other day because it reminded me of one my Nan used to let me wear when I was staying at her house as a kid. I'm not sure what happened to it, but this looks pretty similar and I love it just for that. They haven't photographed too well, but I picked up these glittery tights from H+M last weekend and I think I'll be wearing them rather often - they're lovely and thick which means that they're keeping me warm now that my office temperature seems to have plunged into coldness. Finally, an ancient Topshop cardigan and my dice heels, which a friend reminded me about last week, and I was done, and rather liked the effect. I'm not often that fussed about actually celebrating Halloween - I can't remember when I last really *did* anything for it, but I'm all about a theme when it comes to outfits. Yeah it's "proper Winter" now I feel! I'm actually not all that prepared for it. I kinda like my summery dresses and little cardi's and can't be fussed with leggings or tights and coats yet. LB have so many great things coming out. 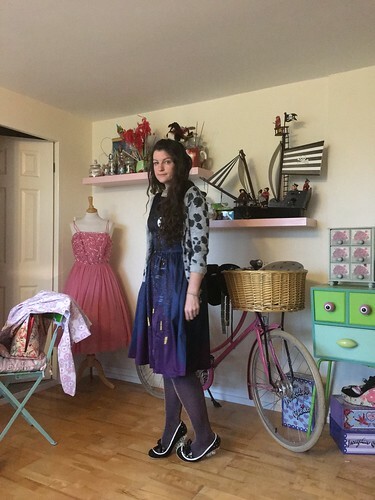 I don't think I'd wear a Halloween themed dress enough to warrant buying it (Winter or Christmas ones I feel I'd get more wear out of), but I do love that print. It reminds me of The Get Along Gang Haunted Mansion my little sister had as a child. I'm excited about the coat thing; I have so many coats which I love that I'm excited to wear again.